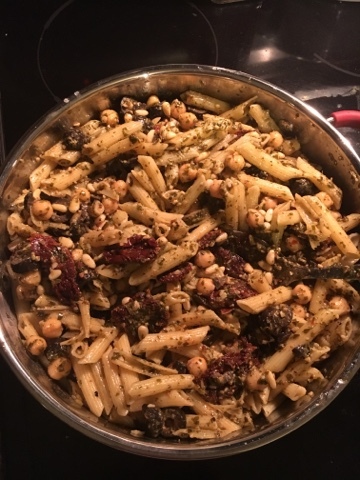 I call this recipe Kelsey's Pasta because it was her favorite as a teenager. She's a vegetarian, and this recipe made me feel like she was getting a balanced meal with some protein. You won't regret making it! Cook pasta according to directions on box or your preference. Prep other ingredients during this time. Put black olives and garbanzo beans in colander, pour sundried tomatoes over it to drain. Add vegetables from colander into cooked pasta directly into pot on stove. Add basil pesto and stir well to coat. Warm through, about 5 minutes on low, stirring occasionally. Serve pasta warm, garnished with parmesan. Yum - thanks! I have a friend who is vegetarian so it's nice to have something good to make when we invite her over!